I am not usually taken to reviewing books, or recommending those from well-established mainstream authors, instead I like to support and promote the hard working, inspiring and enthusiastic Indie Author. However, I am often asked which books I read, what novels inspire me personally, which Authors I like and lots of stuff like that. So I have broken my usual reserve and for once shall reveal a book which had a profound effect on me as a writer, albeit the young, and not very good writer, I was at the time! A review by Paul White. Sometimes and for some unknown reason a book resonates within your soul, this is one such book that did, and still does resonate within me. Down by the Dockside is a too long unrecognised Australian urban classic. Compassionate and sympathetic to the working class in post war Australia. I first read this years ago, (circa 1975). It is about a plucky, literate girl who grows up in poverty in Port Melbourne during the Depression, marries a sailor during the war and loses him in a fight at Christmas in 1946, teaches dance and consorts with the criminals her childhood pals have become, it’s a lively and endearing tale of Australia in the 1930s and 1940s. You may encounter problems when searching for biography on Criena Rohan, because this was her Irish pseudonym. Her real name was Deirdre Cash (1924-1963), novelist, was born on 16 July 1924 at Albert Park, Melbourne. 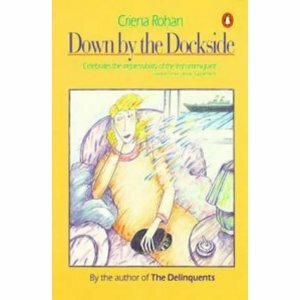 Criena’s first book was The Delinquents (1962). A compassionate tale, set in the 1950s, of defiant, street-wise, ‘bodgie- widgie’ teenagers oppressed by their elders and the welfare state, it was dubbed ‘a back-street Tristan and Isolde’ by London’s Daily Mail. The Times Literary Supplement called the characterization of the heroine Lola ‘a triumph’. In 1989 The Delinquents became a teenage cult film with Kylie Minogue as Lola. As poignant and harsh as the life and stories of her characters, so was Deirdre’s own life. Deirdre was pregnant when, on 4 February 1948, she married a law student Michael Damien Blackall at St Augustine’s Church, Melbourne, but she was also lunging at a gentility she could not sustain. Leaving her husband and son, she earned a living as a torch-singer and ballroom-dancing teacher, occasionally on the fringe of the demi-monde. Although the autobiographical glow of her novels suggests otherwise, she was teetotal, earthy but not indecent in speech, and never in trouble with the police. Similarly, her fictional, family-based portraits are sometimes romanticized, sometimes cruel. In 1954 she met her true inamorato, a coastal seaman Otto Ole Distler Olsen, whom she followed to various ports. Her divorce having been granted on 18 October 1956, she married him eleven days later in the office of the government statist, Melbourne. Cash was dying from a now correctly diagnosed colonic carcinoma when she finalized her second novel, Down by the Dockside (London, 1963), which attempted a more complex characterization of alienated, working-class people in wartime Melbourne. While her often sentimental and melodramatic social realism lacks literary polish and form, this weakness is offset by Dickensian humour, sharp dialogue, throwaway gibes and a gutsy narrative style. She allegedly wrote a third novel, ‘The House with the Golden Door’, but, if so, the manuscript mysteriously disappeared. Survived by her husband and their daughter, and by the son of her first marriage, Cash died on 11 March 1963 at the Alfred Hospital, Melbourne, and was buried in Fawkner cemetery. This is not a literary masterpiece in the common sense, even being rejected by several Australian publishers whom she subsequently scorned as jingoistic. But it is haunting and touching and should be on every ones ‘Must Read’ list. Thank you for taking your time to read this. Should you ever get yourself a copy I would love to know your thoughts on it.